Powered by Mom Blog is part of the Friday 6 hour Flash Giveaway! 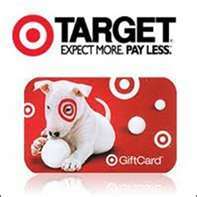 $50 Target Gift Card 6-Hour FLASH Giveaway!!! A few AWESOME Bloggers have teamed up to give you this wonderful $50 Target Gift Card! out and you will know if you WIN in just a couple of hours! WHAT FUN! Good luck on tonight’s giveaway! See you back on Monday for another great FLASH giveaway! Here are our WONDERFUL participating sites for this evening’s 6-Hour FLASH Giveaway!! I bought my hubby some DVDs, a gift card for a co-worker who is leaving for college, and a steering wheel cover. The last thing I bought at Target was comestics. the last thing I bought at target was toys for my nephews birthday! thank you for the chance to enter your giveaway!! I bought clothes and Nintendo DS. Teething tablets and Johnsons baby lotion. Formula for my little girl. I bought a binder for my coupons. Had to stop by a few days ago and pick up a few prescriptions. The last thing I bought at Target is my Nook (and I loooove it!). I buy Target brand diapers (big box) for my 1 y/o. These diapers are great, wouldn’t buy them anywhere else. A $50 gift card can buy another box of them…which is needed. Thanks! The last thing that I bought at Target was Schick Hydro Silk razor refills…I had some pretty awesome coupons too! The last thing I bought for travel supplies for by Beverly Hills Chihuahua 3 Blogger Event! I bought dd’s school supplies there! The last thing I bought at Target was a birthday card for my oldest daughter! i bought a nook there last. Just yesterday! Bought two Zone protein bars ( they are CHEAPER than walmart! And A bag of frozen fruit for my protein shakes! I think it was makeup. Personal supplies for the family. the last thing i bought at target was a pair of gardening gloves, a floor lamp, and 2 t-shirts one mario and one fraggle rock! The last thing I bought at Target was some shampoo. The last thing we bought was school clothes and shoes for my son. We live in a very small town. We have to drive to the next big c ity to go shopping. So, it was TARGET TRADER JOES, SAM’S CLUB and SAW GRANDMA! Last thing I bought was a game for my kids. The lay thing I bought at target was coffee. Its so cheap there. Target opening near me soon! The last thing that I bought at Target was a clothes steamer. I bought some things from the $1 area, some e.l.f. cosmetics, and a dress for my DD! The last thing I bought was a shirt. The last thing I bought at Target was baby food! The last thing I bought at Target was Diet Pepsi! A blanket for my granddaughter. The last thing I bought at Target was Pull ups for my twin boys! The last thing I bought at Target was Pull ups for my twins! We bought toilet paper, wipes, shampoo cereal and more. Time to go back too! Thanks for the giveaway! (This may have gone thru 2 times my browser closed on me before, so if it did, sorry! there is no target near me! I’ve never bought anything from Target. There isn’t one in my town. We bought toilet paper, wet wipes, cereal and shampoo! Time to refill too! Thanks for the giveaway! Sugar Free Drink Mix (Starwberry/Tangerine). Thanks for the giveaway. The last thing was a nutcracker for my son at Christmas time. The last thing I bought at Target was a Nutcracker for my son at Christmas. I bought some Dr. Pepper. The last thing I bought at Target was a drip coffee maker. Thanks for doing the giveaway. School supplies for my classroom. The last thing I bought at Target, was a book. Once Burned by Jeaniene Frost ^_^ This was probably a month ago 🙂 Thanks so much for the giveaway! I buy so much at Target, probably the last thing I bought was candles. The last thing I bought at Target was a crib, last week. We are expecting a baby at the end of the year! The last thing I bought was a ball pit and balls for my nieces birthday. Misc. household items and a few groceries. Oh, I bought several things just this past weekend. I got the cutest little skinny jeans for my daughter and a top to match, sweats for my daughter for soccer, a few things from the dollar spot, and oatmeal bars. I so love Target! School clothes and health/beauty products. Actually what don’t I buy at target. I bought some supplies in the pharmacy section. Thanks for the giveaway! The last thing I bought was groceries. Last thing I bought was dog food. The last thing I bought at Target was groceries. I got paper towels and toilet paper! The last thing I bought at Target was actually school supplies, yesterday. The last item I bought at Target was coffee! The last thing I bought at Target were some groceries. the last thing i bought at target was clothing for my nephew.